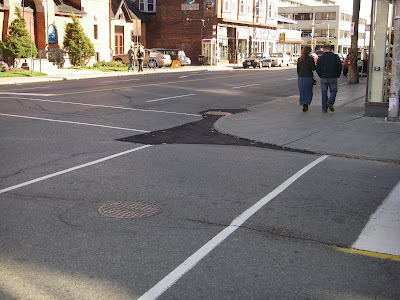 In October 2007, some road workers were applying a hot patch to the South-West corner of Elgin and Somerset, presumably to cover the cracks and to reduce the depth of puddles that form there in rainstorms. According to the weather network, October 26 had a high of 15.8C and a low of 2C, and 4.4mm of precipitation. This photo was taken around 10:30 in the morning. As of this past Friday, the patch was all gone. And then some. More of the asphalt beneath is crumbling away. While we're in the neighbourhood, a gratuitous shot of St. John's church in that oddball snowstorm we had on April 6.